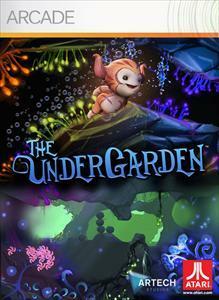 Add the UnderGarden Demo or Full Game to your Xbox 360 download queue here. The UnderGarden does not really have a story. I am not sure if it even has a point, other than the obvious, “get to the end of the level” game mechanic. As with many games, this game does not rely on a story to carry the game. Rather, it tries to do it all with atmosphere and gameplay. And this atmosphere is psychedelically colored awesomeness. One way to think of it is playing through an ocean/tropical reef IMAX documentary, without commentary. To get to the end of the level, you must grow plants in an underwater paradise and solve puzzles. You are, as best I can describe, a Teletubby like creature that can jet around the water like a penguin. Yes, that does sound extremely bizarre, and it is. The fact of the matter is,this bizarre and curious design translates into the whole game and that is a good thing. 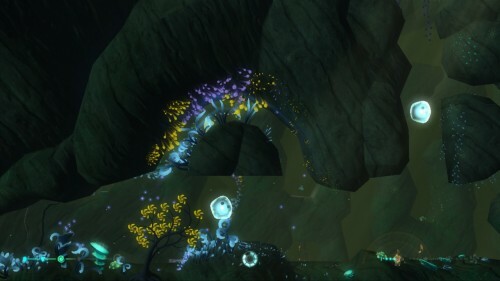 As previously mentioned, you can swim around an under water garden. However, this garden is basically dead. That is, until you distribute some pollen and make it come alive. This part of the game is hardly challenging. But it is somehow very relaxing and very atmospheric. There are puzzles aplenty to be had though. By making flowers or tress grow, you also get to harvest their produce. You can then use that produce to your advantage and solve puzzles with the varying types of fruit. Even the fruit follows the insane rules of the land of The UnderGarden. For example, some banana looking fruits are are really heavy and weigh a ton! They can push down blocks obstructing your way. Unfortunately for the game, puzzle solving is just not that fun. Sure, the first few times are interesting. The different types of fruit do keep it fresh for awhile, but the puzzles are, quite simply, dumb. Also, the controls for the game are awful. 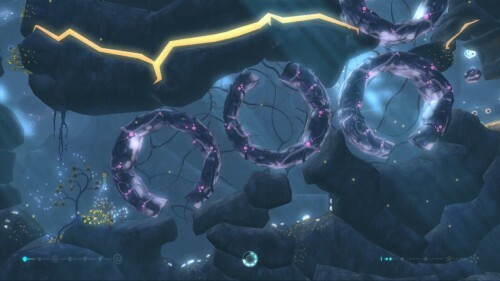 Making you feel like you are actually underwater and having to slog through it may add to the general feel of the game, but in practice it left me jamming the analog sticks every which way. All that being said, the real strength of the game is the way it makes you feel. 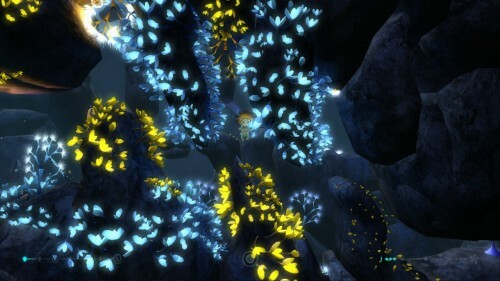 Although the controls and puzzles struggle to perform, the vibrant colors and the relaxing task of just growing flowers make up for nearly all of it. I really can’t explain it, but it IS, for lack of a better word, therapeutic. You may have read in books that gardening is said to be a healing agent. I never really believed them, but I can see how that might be possible now. Not to say that this game is exactly like gardening, but the emotions that crazy colors bring out are fascinating. Maybe that sounds like an exaggeration, but it is just so exciting to see a game developer try something different. So many games are focused on fast reflexes and instant death as a punishment. That is fine. I love games like that. But video games are still entertainment and entertainment can mean a lot of different things. This game is, at the very least, an original idea that brings some slight innovations to the table. At the very most, The UnderGarden dispels the notion that the only video games are about is violence. And it does that in a very cool way with some intriguing elements and, of course, some weirdly awesome colors and characters. Graphics are nothing short of spectacular. They really draw the player into the game and that is great. Each garden was full of each hue of the rainbow and you could also change them up with certain actions. There are some quibbles to be had though. Take as an example, the explosions (yes, even a peaceful game like this has explosions. If you are worrying, stop; no one dies. 😉 ) The explosions are possibly the most boring explosions ever seen. Maybe that is to take add to the general emotion of the game, but wow, they are dull. Audio in the game is not something to fawn over, but it is acceptable. Sure you have a basic soundtrack, and you can capture little musicians that play a beat. Generally though, the music and audio merely provide a background noise and an obligatory emotional backdrop to the rest of the features in the game. 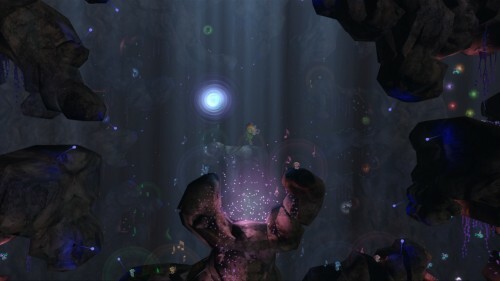 The UnderGarden is advertised as an alternative to the many shooters of this generation of consoles. Its message is “Make Flowers; Not War.” Judging by the stats on Major Nelson’s blog, this will not appeal to some. But if you are looking for a different type of game, this is for you. It may not have the most exciting gameplay, or the latest explosion special effects, but sometimes entertainment is not meant to enthrall, but merely to entertain. Looking for a relaxing day? Look no further than the wildly original UnderGarden.